Canadians are known worldwide for our prowess in the production of alcohol, but we’re practically teetotalers compared to some nations. This is according to a new survey conducted by the World Health Organization (WHO). Leading the pack is the tiny Eastern European nation of Moldova, whose citizens over the age of 15 consumed an awe-inspiring average of 18.22 litres of pure alcohol in 2005. This is almost double the amount Canadians drink. However only 8.22 L of this consumption was recorded, suggesting an unusually active booze black market. Close behind is the the Czech Republic, a nation known internationally for its Pilsner beers. The average Czech consumed 16.45 L, considerably more than their former nationmate Slovakia at 13.33 L and Canada at 9.77 L. Americans consume an almost identical quantity of alcohol as Canadians, at 9.44 L per year. 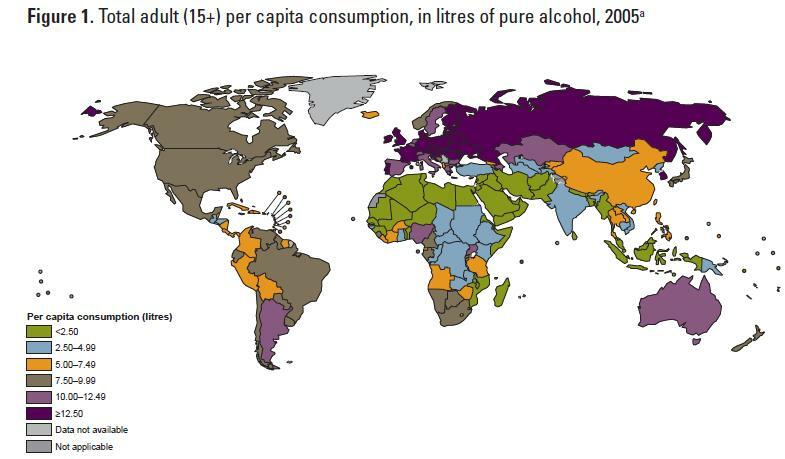 Europe and Russia dominate the list of hard-drinking nations, while predominantly Muslim nations in the Middle East, North Africa and the South Pacific occupy most of the spots near the bottom.